Needing Options On How To Sell A Flooded House Fast? Dealing with a house that has flooded or has experienced water damage can be a very stressful and emotional process. Our thoughts are with you and we hope that you are able to find the correct solution for your problem. Keep reading below for some tips on how to sell a flooded house in Houston. Before going back into your flooded Houston house, please access the damage and make sure that it is safe to walk inside the property. After you are all clear you can now start the process. 1. Documentation is key. You should take pictures and videos of all of the damage both inside and outside of your house. 2. Next you should report the damage to you insurance company so they are aware. 3. You should then remove all of the carpet and furniture. These items can be placed on the curb outside of your house. 4. Begin shoveling out all mud and water out of the house. 6. Drywall should now be cut out from the walls about 2 feet above the waterline. The insulation should also be removed that sits behind all of the walls on the perimeter of the house. 7. This would be a good time to purchase a few fans and humidifiers to get the air circulating throughout the house. You should also turn your air conditioner on to help remove the moisture. 8. Sometime you can get roof damage from the rain storm so if you do have damage, put a tarp on the roof as quickly as possible. When selling a flooded house in Houston you will need to repair all of the areas that were damaged. The roof will need to be repaired according to the damage. The sheetrock will all need to be replaced and painted properly. A lot of potential buyers will be scared away if items have not been repaired correctly after a flood, so it’s very important that you make the house look as nice as possible. Another way to sell your flooded house in Houston and get top dollar would be paying a professional inspector to inspect your house. The inspector will create a final report of the property and if everything was repaired correctly it will show in the report and you could present that document to the potential buyers. That is a great way to remove the fears buyers have when considering buying a flooded house in Houston. To be completely honest with you, repairs can be a little hard to deal with when you have a flooded house in Houston. A lot of the times when repairing flooded homes, other effected items pop up that you didn’t see initially. 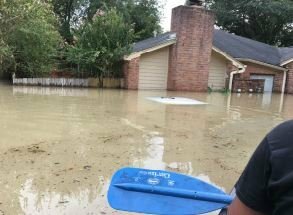 If you are not able to make any repairs to your home and don’t have the correct insurance, you can still sell your flooded house in Houston as is. You could work with a realtor, but in many cases they will require you to make the repairs before they list the property. You will also have to pay their commissions and risk the property sitting on the market for months and months. If time and budget is an issue, your best option would be to call us at ARCO Home Solutions. We can buy your flooded house in Houston cash, we can pay all closing cost and make all the needed repairs. You would not have to lift a finger or pull a single dollar out of your wallet. To get more details and a free no-obligation cash offer, fill out the form below or call us at 713-742-2577.